This celebration of American art pottery is an introduction to the history, style, and artists of the movement. From the 1880s to the 1950s, handcrafted art pottery began replacing industrially produced ornamental works. Individual ceramic artists and potteries emerged. Rookwood and Roseville are among the renowned producers producing American art pottery. The Metropolitan Museum of Art’s Frelinghuysen (Anthony W. & Lulu C. Wang Curator of Decorative Arts) and assistant research curator Adrienne Spinozzi, with Rutgers University art professor emeritus Martin Eidelberg, trace the history of the movement and place it in the context of commerce, design, and social history. During this period, handcrafting became an integral part of social history, appearing in schools, along with the encouragement of women to learn skills and seek education. Ceramic artists were experimenting in form and color, testing and developing glazes and designs. 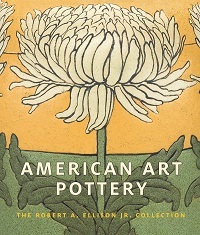 Carefully researched and beautifully illustrated, this volume is complete with photographs of American art pottery from the collection of Robert A. Ellison Jr., who in 2018 donated 300 pieces of American art pottery for the Met’s American wing. The white translucent porcelain that traveled from China across the Arab world to Europe captivated the elites of the 16th and 17th centuries. The quest to surpass the Chinese led to experimentation at dozens of manufacturing sites across Europe. The goods were so important that the Duke of Würtemberg declared that owning a porcelain factory was necessary to the glory and dignity of a prince. Augustus the Strong of Saxony amassed a collection of 24,000 porcelain pieces that became the most prestigious in the Western world. The fever for collecting porcelain has continued and the fruits of this passion have descended to the Metropolitan Museum of Art in New York, with the finest collection of European porcelain in America. This sumptuous volume is the first general survey of that collection. Designed to appeal to the general public without stinting on careful art historical analysis, the superb photographs of 90 objects or sets are accompanied by two to three pages each of thoughtful text. 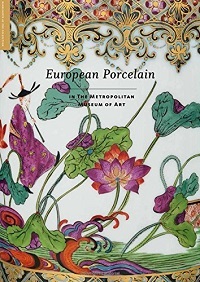 There are also essays about porcelain in Europe’s history and the collectors who donated the bulk of the Met collection.